One way to fix Bat Drag. 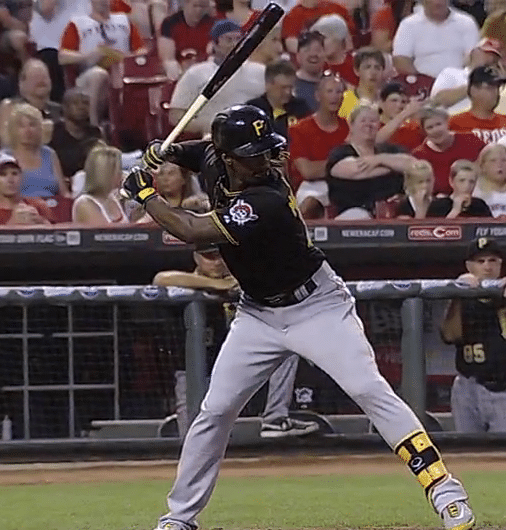 Notice the difference in Charles’s barrel angle. This is when the front arm “bars out” before the Final Turn. Also known as “Casting.” And it’s an oftentimes frustrating youth baseball hitting fix. James Brown’s email response was after I produced this youth baseball Shin-Soo Choo: Can Front Arm KILL Bat Speed? video post. …”I see what you’re saying and agree…to hit the ball the farthest, a straight front arm would be ideal. Look at golfers for instance. But here’s the problem…a hitter in a game doesn’t know with 100% certainty: pitch location, speed, and pitch type. In the home run derby, hitters know the pitch speed, type – and for the most part – location. I agree with Perry Husband in that hitters should make it a goal to get to impact with a long front arm. However, I don’t agree in getting a hitter to bar that front arm out early on, pre-turn. It’s a simple Conservation of Angular Momentum issue. CLICK HERE for a short 2-minute Circus Physics video from PBS on this movement Principle. An ice skater speeds up by tucking her arms in towards her rotating middle. She slows down by extending her arms away from her rotating middle. Rotating speed goes up when the rotation is tighter (bending the arms), but inertial mass decreases. Inversely related, when the arms go out, her inertial mass increases, but her rotating speed decreases. This is how Angular Momentum is conserved. So, unless like Perry teaches, Pitch Recognition and Strategic hitting game plans against specific pitchers is supplemented, I don’t see the logic in teaching hitters to early arm bar, pre-turn. Because barring the front arm out early will slow rotation down (think arm extended ice skater), and on higher perceived velocities to the hitter, high or inside the strike-zone, why would we want our hitters to turn slower at the beginning of the turn? The bottom line? Youth baseball (or softball) swing game mechanics are slightly different than in batting practice. “Five-o-clock” hitters typically aren’t very effective in games. And let me tell you, all my pitching friends LOVE pitching to early arm bar hitters because they have a weakness to exploit. Just like hitters that swing down on the ball and extreme upper cutters do. You see, the problem with bat drag at the youth baseball level isn’t the move itself, but how the compensation is triggered. What’s happening before the front arm bars out? Is the hitter properly activating the springy fascia within the torso? Hey Lou, are you asking about not getting the elbow into the Slot Position (as per Jaime Cevallos?) before the Final Turn, or picking up the front foot? Next week’s blog article will talk about a new hitting aid that will help with the hand (or knob) first swing. Joey…I could use some help. It seems to me that you do the first three correctly…show your numbers, hide your hands, and angle downward with you shoulders and STILL have bat drag. I have a kid that does those three correctly but then his hands drop backward when the rear elbow begins to move toward the hip and then the elbow gets to far in front of the hands and the front elbow straightens out. He can’t seem to break it. I understand what you mean by creating tension in his arms before the final turn. However, it would seem to me that creating tension would cause him to be tight and being tight and tense makes for a bad swing. I took a video of him swinging and after looking at it, realized there is more to it than meets the eye. First of all, yes he is straightening out his leg. However, two things are apparent. One…he is not showing his number as long as i thought. Two…he is actually opening up to quickly. While he is keeping his head on the ball, I can see that he is actually beginning to open his hips while his front foot is landing. It just looks a little too soon…even if only by a fraction. I am not sure if this is affecting the bat drag issue or if it is a whole additional issue to deal with. With the bat drag, his hand and bat head drop backward when the rear elbow begins to move toward the hip. In fact, I think the rear elbow moves too far forward and gets to far in front of the hands and the front elbow straightens out. I am trying to figure out a drill to help him. Something he can do over and over to build the muscle memory. What do you think? Mike, on the tension thing. We want to create tension in the springy fascial material. If we do it right, then the muscles will help “lock in” the stretched and loaded fascia, like the locked click of a gun hammer. Joey…ok…trying to implement a few things we have discussed and doing some reading has led me to a couple of thoughts. Tell me what you think. First of all, if we can do something about that racing back elbow, we may get somewhere. I think I read somewhere where you mentioned putting a rubber ball between his bicep and forearm to help with bat drag. I was wondering, what if we also place a similar ball in his armpit simultaneously. Presently, I notice that his rear elbow is racing forward as his front foot is landing. In my mind perhaps holding the ball in his armpit will prevent him from moving that elbow forward to quickly or it will drop. Also, making sure he shows his numbers UNTIL his front foot touches. In addition, I am also wondering if the prohammer training bat will be of some help because one of the results of this racing elbow and thus, bat drag, is rolling his wrists. Am I way off here? I have been struggling for the past 2 years with a player that lands with a flat bat. The initial gather looks great bat is in a great spot. But when the front foot lands the elbow starts to slot early and the bat flattens. Is this bat drag? It’s almost if his swing starts too early and his back knee and elbow start firing as the toe lands and then the heel lands the barrel flattens. I have done everything and cannot get this corrected. I bought your videos and there is no real fix to this. I need some guidance. 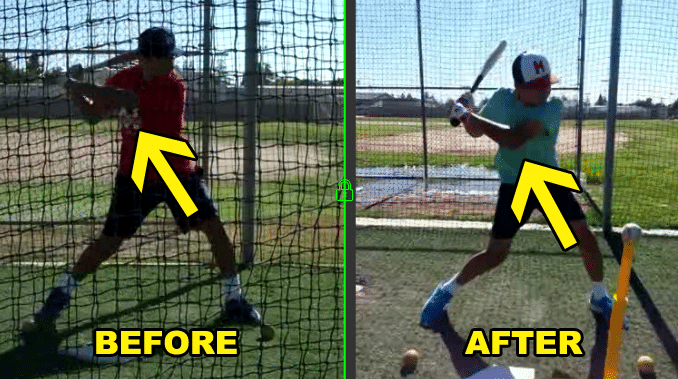 Baseball Hitting Case Study: Why This Won’t Work… Baseball Training Aids: Long Slow Swing Fix?